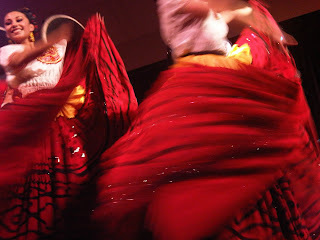 Inspired by Reyna Grande's book, DANCING WITH BUTTERFLIES -- about four women in a Mexican folkloric dance troupe --, some of the members of New York's Latina bookclub went to see the Ballet Folklorico de Mexico de Arianna Hernandez on February 24, 2010. It was wonderful! 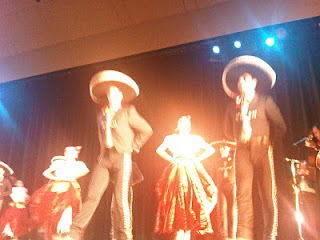 In the audience were dignataries and politicians -- Mexican and American. There were also lots of families with children. I felt like a kid myself. In Reyna's book, she talks about a dress with 10-yards of fabric. I saw that. 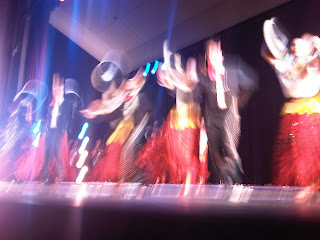 She talks about the dancing couple forming a bow with their steps, I saw that. It was the book, the dances come to life. It was a great blend of both the literary and the real worlds. 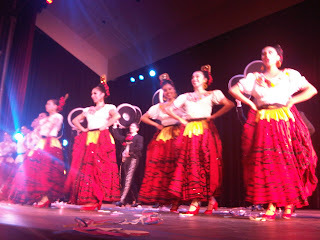 So for anyone who has read or is reading Reyna's book, do try to see a Ballet Folklorico live. You will be entranced.